The Nashville Predators know they'll have to start stringing together some wins if they hope to stay in the playoff hunt. The Predators will be trying to end a season-high three-game home losing streak on Thursday when they meet the league-worst Los Angeles Kings. Nashville (35-28-8) lost 2-1 to San Jose on Tuesday for its third defeat in four contests. The game was the first at the Sommet Center following a 3-3-0 road trip for the Predators, who have not won at home since a 5-4 victory over Edmonton on Feb. 19. Nashville, in ninth place in the Western Conference standings, is trying for its fourth straight postseason appearance. "It's been a critical stretch run for us for a long time," said goalie Dan Ellis, who made a career-high 40 saves Tuesday. "It's especially critical because we have fallen a little behind. "We lost two in a row, but we need to battle back, and we need to put a streak together so we aren't relying on others to lose in order for us to make the playoffs." After this game, the Predators play Saturday in Detroit before returning to Nashville for four straight games. The Predators are 20-11-4 on their own ice this season. "Hopefully we can get some teams to lose, and that keeps us in the hunt," defenseman Greg Zanon said. "Hopefully we can put together a streak of our own. We just need to come out with the right mindset. Every game is do or die, and we need points." 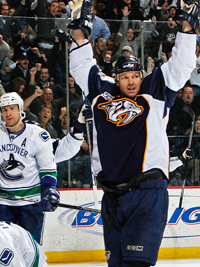 Jason Arnott scored the lone goal for Nashville on Tuesday, giving him six goals and 10 assists during a 13-game point streak at home. He has 18 goals and 27 assists in 48 career games against the Kings (27-38-6), and had three goals and an assist in his team's 4-3 home win over Los Angeles on Dec. 22. Arnott also had a goal and an assist in the last meeting between these teams, a 7-0 win in Los Angeles on Jan. 8. 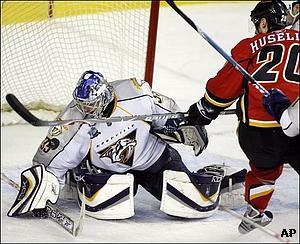 Chris Mason made 28 saves for Nashville in that game, improving to 4-1-0 with one tie and a 1.44 goals-against average in seven career games against the Kings. The Predators have won seven of 10 against the Kings and are 4-1-0 with a tie in their last six home games in the series. The Kings have dropped seven of their last eight overall, including Monday's 2-1 overtime loss against Vancouver. Patrick O'Sullivan scored the lone goal for Los Angeles, which owns the worst record in the NHL. The Kings gave up the game-tying goal with 2:41 left in regulation. "We were so close to it. That's what's so disappointing," said Dan Cloutier, who made 38 saves. "That's a very good team that's fighting for their lives over there. We gave them a big scare, but it would have definitely been nice to steal those two points from them." The Kings, who have scored no more than two goals in any of their last six games, fell to 3-27-3 this season when failing to get at least three.